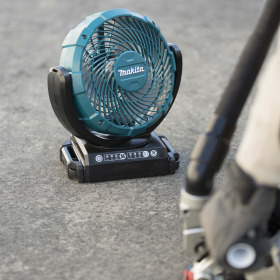 Two new Makita portable fans have been introduced in response to customer demand for rugged, high performance fans of compact size. Ideal for the workshop, home or office, these neat, space-saving fans measure just 180mm in diameter but still create a significant but comfortable air speed. The CF101DZ 12VMax Portable Fan joins the ever expanding and highly popular CXT range and can be powered by AC mains power, or by DC battery operation using a Makita CXT battery. Corresponding run times for the 12VMax model when powered by a 4.0Ah CXT battery, without oscillation, are 4.5hrs in Hi, 6.3hrs in Medium and 10.5hrs in Lo. With oscillation this reduces to 4.4hrs in Hi, 6.1hrs in Medium and 9.8hrs in Lo modes. Using Makita’s 6.0Ah LXT Li-ion battery, the new DCF102Z 14.4V/18V LXT fan achieves outstanding run times without oscillation, of 9.6hrs in Hi, 11.8hrs in Medium and 21.2hrs in Lo modes. Run-times with oscillation are 9.3hrs, 11.4hrs and 20.2hrs in Hi, Medium and Lo modes respectively. Both models feature an automatic oscillation of 45° to left and right. Both models have three speed settings giving a maximum air speed of 180m/min in Hi mode, 150m/min and 120m/min in Medium and Lo settings respectively, with an air flow in Hi, Medium and Lo of 4.6/3.8/3.0m³/min. These high performance body only machines have a screw hole for mounting onto a tripod, an adjustable hanging hook, and a fan head which can be conveniently angled up and down as well as left to right. An off-timer switch with LED display allows three settings of 1, 2 and 4 hours of output. The DCF102Z model also features a release button for vertical angle adjustment of the fan head. The CF101DZ and DCF102Z portable fans weigh in at diminutive maximum weights of 1.7kg and 2.0kg. Two new LED torches have also been added to the range, the DML808 LXT and ML105 CXT. The new DML808 is compatible with both 14.4V and 18V Lithium-Ion batteries – the same batteries that power your ever-faithful Makita power tools. By simply twisting the torch head the beam can be usefully adjusted from wide to narrow. The ML105 can be powered by Makita’s CXT 12V Max slide batteries. The LED provides a sharp, round spotlight and the pivoting torch head has 12 positions with positive stops from 60° - 110°. The aluminium flashlight head is designed for increased durability and the multi-faceted reflector controls the direction and spread of the light.